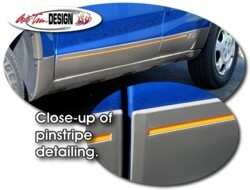 Detail your VUE with pinstriping the fits perfectly within the Side Body Rocker Cladding's indentation as shown. Kit comes with a total of 18 lineal feet of pinstripe (trimming of length is required) that is available in a wide variety of colors. Very easy to install. Easy to follow online application and care instructions are included.